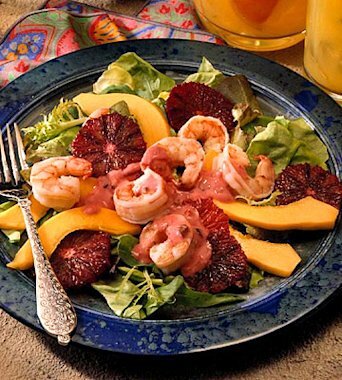 Caribbean flavors and colors highlight this great salad that features shrimp, salad greens, blood oranges, and sliced mango. The mayonnaise, orange juice, and lemon (or lime) juice dressing is spiced up with chili powder and finely chopped jalapeno pepper. Remember, when working with jalapenos, or any other chile peppers, it's important to follow our valuable tips for proper handling of hot peppers. 1Finely shred 1 tablespoon peel from blood oranges. Stir together mayonnaise, orange juice, the reserved blood orange peel, jalapeno pepper, lemon or lime juice, and chili powder; set aside. 2Peel and thinly slice blood oranges. Divide greens among four plates. Top with shrimp, blood orange slices, and papaya or mango. Serve with dressing. Makes 4 servings. 3Food exchanges: 1/2 vegetable, 2 fruit, 1 meat, 1-1/2 fat.